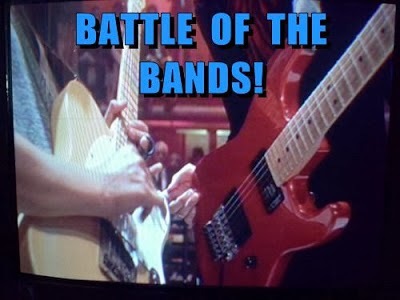 It's Battle of the Bands number 13. Time for some creepiness. And I've got a song today that's pretty darn creepy. Check out the lyrics on this song told from the viewpoint of an obsessed stalker. Not sure any of us would want this creep lurking about, but it makes for a pretty cool song. Take a listen to the two versions and then let us know in the comments which version you like the best. Listen closely--the arrangements are similar, but also very different in some important ways. Gritty heavy metal action in this early Queensryche outing. Vicious vocals and cutting guitars give this version an edge. Listening to this and watching the video kind of freaks me out. Pretty sinister. But some great hard rock. And actually they could have made the video a bit scarier. The vocalist doesn't look all that threatening in the end. How do you like this one? Before Queensryche released their version of this song, the composer had already released her own version. Lisa Dalbello could have been a fashion model, but instead chose to be a singer-songwriter and voice-over artist. She signed her first record deal with MCA records at the age of 17 at which time she was already a seasoned performer. My first encounter with Dalbello's music was when I was working in Canada in the mid-1980's and saw her perform on the Juno Awards show--that is the Canadian music awards. Her performance blew me away and I became a fan of her music. Check out the video on this one. Who's obsessed with whom? There you have it. Two similar, but different versions of one song. Which do you like best? Tell us your favorite in the comment section and let us know why you like that one best. "Almost Blue" and Almost Here. Dear Lord, no contest! Queensryche. I was already a big fan when they released that song. I didn't watch either video because I didn't want to be influenced by who made the best video. This is not the genre of music I was listening to in the 80s, so the song was new to me. I preferred the Queensryche version. Not my genre of music, but I'd go with the Queensryche version. Both were pretty evocative and haunting. Blast--I'll have to come back and listen to these. They won't play on the computer I'm on. But it certainly looks like Queensryche is winning! Queensryche gets my vote, as that second one is very creepy. But in truth, didn't like either, even Sting's song about "I'll be watching you" came off as as stalker song too. Alex -- I could have guessed your vote. Robin -- Both videos are pretty good so I don't know how much influence it would have been. So you prefer the heavy metal version. Liza -- It's a hard rock Saturday morning apparently. Morgan -- Hope you come back to vote. DG-- I thought you might pull for the Canadian artist. Sting's song is very stalker-like. Laurie's choice: "I'm not a big fan of her voice, so I'll go with (QR). Chris's take... Not in my wheelhouse. This is a dogfight I'd probably just go back inside and hope the owner took the hose to them soon. I'll take QR just because I think they'd be less likely to kill me in my bed. The QR version. The other one was too slow for me, but that Lisa chick definitely gets my vote for best eyebrows. I found this battle as difficult to vote on as the one at Mr. McCarthy's site, but for the opposite reason - here I really, Really, REALLY didn't like either version of this creepy song. For the sake of voting I'll go with Queensryche (I'm guessing that's what the others are referring to as QR - because they didn't want to scroll back to see how to spell it out, like I had to). That woman just creeped me out a little bit too much. I have heard of both these performers, but this is the first time I've actually heard either of them perform. After listening to the QR version, I had two thoughts: 1) I will definitely be voting for the Dalbello version, and 2) I always thought I couldn't sing, but now realize that had I pursued it, I might have become a professional singer after all. And now, I'm off to start recording some demos because I think my voice might just be the next big thang. The only thing scary or sinister about the QR version is the lead singer's hair. But I do like the band. However, I think my vote will go to Lisa for this particular song, and the accompanying video, I'll vote for Lisa. She sings this with more passion, and the video has more of the obsessive vibe that the lyrics intend. CW-- I guess that counts as 2 votes for QR. Andrew -- I guess that could be a vote for "All You Need Is Love"? Or maybe "Bye Bye Love"? Thanks for the visit. Leeee-- Since we're not voting eyebrow QR gets another vote. Faraway - Aw, c'mon--Lisa is really cool. StMc -- Okay Mr I-can-sing-better smarty pants, your vote for QR is recorded. Donna --Finally someone comes to Lisa's rescue. A vote for Dalbello. I think both versions are pretty darned awful. It's close, now that my ears have recovered from the cheesiness. I will vote for number two. I listened to a half minute of each. Interesting. Not my genre of music. Looks like Queensryche is winning. I was surprised that Dabello's name sounds familiar to me, and I am certain that it is probably from your blog but I cannot remember the post. I thought this was going to be Queensryche hands down, but this was tough, and I think I havew to go with the composer. Like Robin, I did not watch thew vids, just listened. Had I watched the video before voting (just watched them), I might have gone the other way-her video is a little disturbing. This was close-like Alex, I was already familiar with the Queensryche song. CW-- I'm for the abbreviation! Gary -- A vote for the homeland. Anita-- It could grow on you--maybe. Larry -- But Dalbello's video does a good enactment of what the song is about. Lisa gets your vote. To briefly clarify what I posted above, I want to add that, for me, this song might not actually be a bad one... if it had been treated more like a song than a Shriekfest. But, as several comments other than mine also testify, when one goes for the avant-garde, cutting (or slicing) edge approach to something, it is bound to lose the enthusiasm of a fair amount of the listeners / voters. There's nothing wrong with "walking out there without a net", but one must be prepared for a less than thrilled response. StMc-- Obviously the audience for this BOTB segment is far different than the audience that turned Dalbello's album that this song appeared on into a big hit in Canada and got it 4 Juno nominations. Lisa Dalbello also has a respectable following in Europe, but those fans have different tastes than those who voted here. I differ from the opinions expressed that Dalbello is "shrieking", but I will explain more of my thoughts this Friday when I announce the winning artist. I'm also not a fan of either version. The second one is slightly easier on my ears.